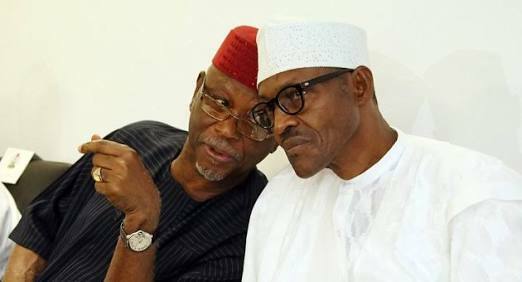 Oyegun’s ‘Hidden Agenda’ On Tenure Extension Exposed? Rather than go away, tenure elongation is still haunting the All Progressives Congress (APC), despite the position of President Muhammadu Buhari. Some of its members yesterday cried out over the content of a memo presented to the National Executive Committee (NEC) meeting on Monday by Chairman John Odigie-Oyegun. According to The Nation, they claimed that a portion of the memo was aimed at achieving tenure extension through the backdoor. But the party leadership denied having any hidden plan to extend its tenure. The NEC rejected tenure elongation for Oyegun and other members of the National Working Committee (NWC). It, however, granted them waivers to recontest at the party’s congresses and convention for which no dates have been fixed. President Muhammadu Buhari was at the NEC meeting to, according to him, “nail the coffin of tenure elongation and also declare my re-election bid”. But in his memo, Oyegun said the Simon Lalong Technical Committee recommended, among others, that: “if for reasons of inability to fulfil constitutional and or legal conditions requisite for the conduct of a valid elective congress or convention, then, the party may as a last resort leverage on the NEC resolution of February 27, 2018, which in our view is lawful in the circumstances.” Recall that the NEC, on February 27, approved tenure extension for Oyegun and his team, but reversed itself following the President’s intervention on March 27. Referring to the committee’s report, Oyegun insisted that the February 27 decision of NEC neither violated APC constitution nor the 1999 Constitution. Sources said yesterday that the adopted memo may “trigger problems”, especially if the proposed congresses and convention are not held. Other recommendations approved by the NEC include a 21 days statutory notice for the holding of elective congresses and convention to be given to the Independent National Electoral Commission (INEC) immediately; the current zoning formula for party offices be retained; requirements of Article 31 (111) be waived in line with the provisions of Article 13.4 (xv) to avoid disruptions in the management of party affairs at all levels; and all pending suits in respect of this matter be withdrawn. Oyegun recalled that on February 27, the NEC voted to authorise all elected officials to continue in acting capacities for a period not exceeding 12 months after the expiration of their tenure. He said the President observed that the NEC’s decision might have contravened the party constitution and the 1999 Constitution. The chairman noted that, following the President’s observation, the NEC authorised him to set up the Lalong committee to advise the party on the way forward. The 10-man committee, he said, was mandated to examine the President’s position and recommendations. Quoting the committee’s report, Oyegun said: “After citing relevant statutes and authorities, the committee concluded that the decision taken by the NEC at its meeting of February 27 did not violate either the constitution of the party and that of the federation. “In essence, APC is competent through its relevant organs, to constitute caretaker committees to run the affairs of the party upon the expiration of the tenure of its elected party officials where, for some reasons, it is impracticable to hold elections before the requisite effluxion of time. Oyegun said the Lalong committee recommended as follows: “That although the decision taken by NEC on February 27 is legal and constitutional, and violated neither the party constitution nor that of the federation, it is still in the best interest of the party to conduct congresses and convention. Dispelling fears of the NWC extending its tenure, APC spokesman Bolaji Abdullahi said the party was already preparing for its congresses and convention. He described the NEC’s decisions as a stop gap measure, pointing out that there is nothing constitutional about them. Abdullahi dismissed insinuations that the party leadership may leverage on that not to hold congresses and convention. He said: “I can assure you that we are preparing for congresses and convention. The congresses and convention will hold and so, there is nothing like anybody leveraging on that to ensure that congresses do not hold so that some people will remain in office”.